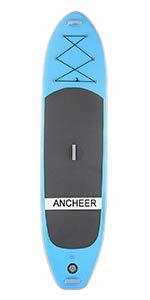 Ships from and sold by Ancheer. 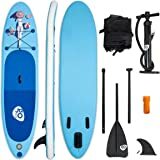 We love these SUPs!! 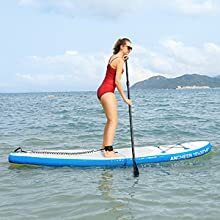 I first bought one for my boyfriend for Christmas because he wanted to try out stand up paddle boarding. He didn’t pull it out of the box until just last month (April 2018). I was concerned that if anything was wrong, it was too late to do anything. However, we blew it up (using an electric pump my dad gave him for Christmas, which works AMAZING! Pumps in a couple minutes-EASY) and off he went. Very rigid! In fact, it looked so great that I bought myself one. Now we both go out. I must note that we use these on a fairly calm lake. I have no idea what they would be like on a really choppy waters. In fact, I really don’t know what features are needed for choppy waters. I feel that if I had better balance, that I could handle them on this depending on the chop. The bags they come in are great. Everything fits in perfectly. We love being able to keep it all neat and our stuff separate. 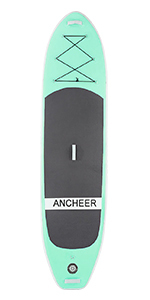 The third fin goes in and comes out easy, just make sure it’s in well and don’t forget about it (take it off) when your wrestling the board about, so you don’t break it off. (My guy does that. I feel like the fin protector). 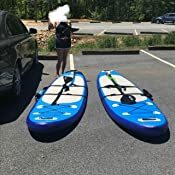 I personally like the paddles, they will adjust to any length, and I was able to really steer and go about quickly with mine, but again, I’m brand new at this. (I also enjoy doing this on my knees and just laying out on this. 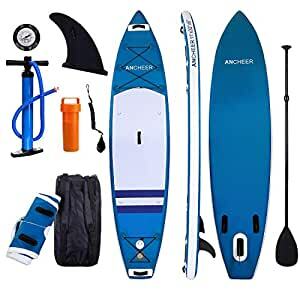 I totally am not a big sport paddler/gal, but my guy is, he’s a triathlon dude, ex surfer, etc, and wanted to get back in the water and start w something like this that I might be able to do with him). The bungees on this make it great for bringing things with, and there are clips too. The surface area is a perfect light grey/almost white, soft almost rubbery with anti slip grid like design. It covers a large portion so you have plenty of space to stand, sit or try yoga ;-). This surface does not get hot, at all. It’s soft enough to sit on for a while. (Haha, it did that as well as lay on it). It is also a great non-slip. It is very light to carry, tho a little awkward. If I can carry, with really bad back issues, anyone can-tho I don’t carry far because I don’t have to. I don’t really think it has to have the carry straps, however, they have the Velcro for paddles. I think without them there would be a way to figure how to attach them. Tho the straps are cheap and worth getting. Deflation is a breeze!!! So fast! Rigidity- we inflate to 15 psi, for some reason I thought we could go to 20. 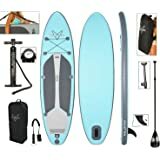 I think I’ve read too many sup descriptions. We find it hard to tell that it’s inflatable. 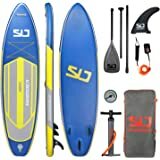 I asked my guy that now he’s got this down, if he’d like a better, more expensive sup and he doesn’t, he absolutely loves this one. 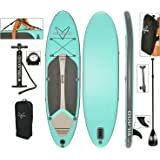 You seriously can NOT beat thi board for the money. 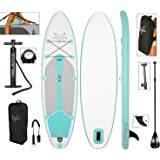 I wonder if a more expensive board would even be that much better, if any. I believe we’d have to jump A LOT higher in price than just a couple hundred to beat this. 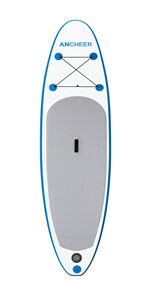 I love love love this paddle board. I got it at the beginning of summer and I've taken it out almost every single week since then. 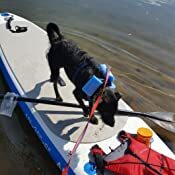 I've gone out with myself, a 10 year old, and my large dog all on the board together and it's held us all (of course the heaviest of us is barely 100 lbs). 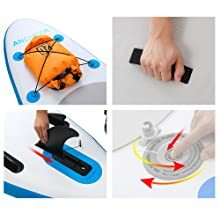 The only reason I'm giving this board 4 stars instead of 5 is because the little yellow button on the part where you inflate the board broke after like 2 uses. I can still use the board fine so it's not a huge deal, but now when I remove the pump I have to do it as quickly as possible and get the cap on because it doesn't hold the air in anymore and I lose a bit of air pressure in the board. Once or twice I haven't been quite fast enough and I had to put the pump back in and pump it up more before going out, which can be frustrating. 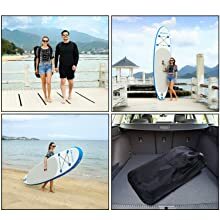 Comes last week, well packed and great sup. rigid and sturdy. 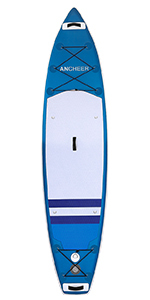 Suitable for all abilities and skill levels, Curved design can be used for all-round SUPing on flat water. 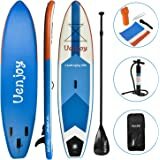 what's more, the accessories of this iSUP package includes a Bravo pump that other big brands does, It’s a surprising addition for a budget SUP to include such a quality pump. 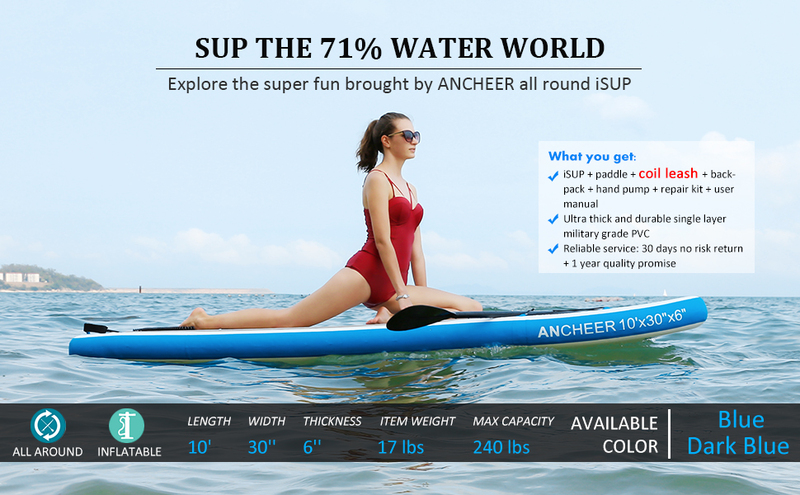 It’s dual action meaning you pump your SUP up with every push up AND down. Which, you guessed it, means way less effort. As well as built-in pressure gauge to watch for your optimum 15 PSI and the inflate/deflate option. You can’t get much better than that! It’s honestly one of the best hand-pumps on the market. would like to recommend! 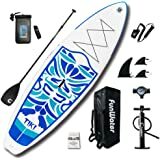 I bought the paddle about 5 months ago, have used it on numerous occasions, and am very satisfied with the quality of construction and its durability. 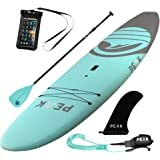 Another review highlights the fact that the blade (as noted in the Amazon ad) is nylon with a "carbon fiber" print on it. 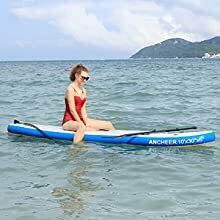 This, of course, makes the paddle slightly heavier than a paddle with an actual carbon fiber blade; however, given the low price of this paddle and its other good features, it is a reasonable compromise. 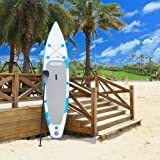 The shaft of the paddle is made from carbon fiber and fasteners for the well-designed and efficient adjustment latch are stainless steel. To address two issues I identified after a few uses, I bought a 39" piece of X-Tube Heat Shrink Sleeve Wrap Tubing For Fishing Rod Grips (available from Amazon) and cut a 24" piece to install on the middle portion of the shaft. One objective was to ensure a good grip for my lower hand when the paddle is wet. 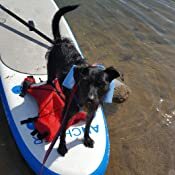 My other objective was to make it easier to locate the paddle if I lose it in the surf. 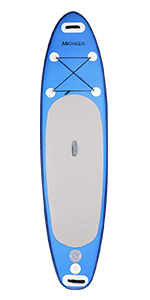 The yellow wrap makes it much easier to spot the paddle in whitewater than the plain black paddle. Of course, this wouldn't be an issue in flat water paddling. 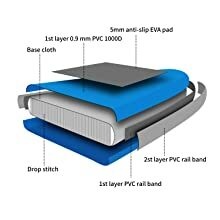 The nylon carrying case is sturdy and one interior side has a layer of heat-reflective material. The description states a carbon blade, however the paper in the packaging states a "nylon blade + carbon print", so that's misleading. Still, the blade does seem strong, much more than the plastic-y one on another paddle I recently tried (and the top tube broke, so it's being returned). This one is a bit heavier than that one, so I'm optimistic that it will hold up better to "touring" use here in Michigan. I look forward to trying it out. I'll update this as needed. 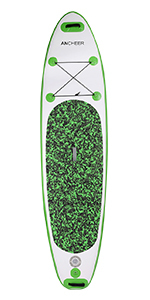 I really like this paddle board. 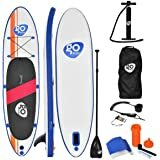 Very stable and easy to learn to use. 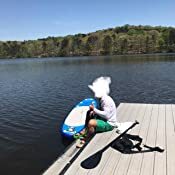 This is my first SUP and I was able to stand up fairly quickly. 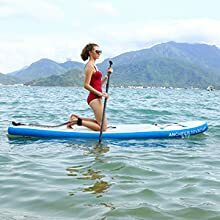 It is quite easy to paddle from a kneeling position as well. 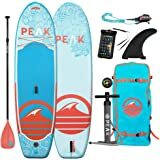 It appears to be well made, the backpack and pump are quite nice and the paddle seems to be more than adequate. 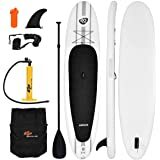 It does take a bit of effort to pump the board up, I plan on purchasing a valve that will allow me to inflate the board using my electric air compressor. I did have a problem with the valve having a small leak around the outside when I first inflated it, after exchanging emails with Ancheer they suggested that I remove and reinstall the valve and the problem seems to be gone. They were very responsive to my questions.